Coaster’s experiential media arm it he only national mobility OOH media company in the U.S. We handle all of the details to the most effectively activate your unique advertising campaign. Do it for a month, quarterly, yearly, etc…it’s your call, you can choose the length (in monthly increments) of your campaign. You design the ad, we’ll print and install it. The pedicab drivers will take your brand to the busiest places daily in the coolest parts of downtown areas…guaranteed to maximize impressions! 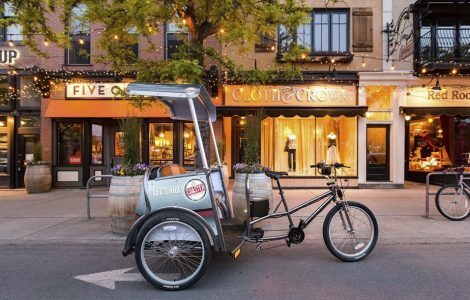 Pedicab Outdoor creates customized fabrications that can be added to your branded group of pedicabs. We can build pedicabs with a likeness of your product sitting on top of the frame. Pretty much anything can be fabricated including bottle and can pedicabs, airplane pedicabs, DJ pedicabs fully equipped with speakers and amps even build a surfboard on top of a pedicab. General Branding/Sponsorship – Get the word out prior to your Sponsorship Activation with a General Branding campaign that starts a month or two before the targeted activity. When the event begins, Pedicab Outdoor will switch into Sponsorship Activation mode. Start with your ads on the pedicabs then provide courtesy rides and/or distribute your product at conventions, sports events, grand openings, concerts, festivals, pretty much anything you’d like to target. The pedicab drivers are your Brand Ambassadors. You can outfit them in branded apparel, provide them with talking points and collateral for them to distribute. Pedicab Outdoor will take lots of great photos and provide you with a POP (Proof of Performance Report) that details the campaign activity.